Oktoberfest beers actually come in two distinctly different styles, here are the differences. In the flock of beer styles, Oktoberfest is a bit of an odd duck—they can be extremely tricky to classify. "But aren't Oktoberfest beers just the beers served during Oktoberfest?" you might logically ask—and you would be right. But therein lies the problem. Unlike most styles, Oktoberfest brews aren't particularly beholden to any one characteristic; instead, they are tied to a specific time. First, let's go through what we know for sure. The style of Oktoberfest includes both the beers specifically brewed for serving, or in the style of those served, at the world's largest beer festival, Oktoberfest in Munich, which takes place each year in mid-September (September 16 this year). That means these beers are typically consumed in September, not October as the name suggests. Also Oktoberfest beers are almost invariably lagers. (If you wanted to brew an ale for your Oktoberfest party, no one can stop you, but you'd definitely be bucking tradition.) However, surprisingly, the type of lager varies significantly, causing our biggest source of confusion. "When talking about Oktoberfest, it's important to understand that the beer has changed since the first festival in 1810," says Goose Island R&D Manager Mike Siegel, explaining what he believes to be the biggest misconception about the style. Siegel recently worked with Munich's Spaten Brauerei, one of the festival's official breweries, to create a new Oktoberfest beer for Goose Island. In America, our Oktoberfests tend to be red hued, slightly sweet beers known as a Marzen. But at the actual festival, the beers are closer to what most of us think of when we think of a German lager: paler beers, similar to another German style known as a Dortmunder. "[Back in 1810], the beer of Munich was Dunkel, a dark lager, and by 1872, the amber beer [aka Marzen] we are more accustomed to was introduced," Siegel elaborates. "As a result of using paler malts, it continued to get lighter in color throughout the 20th century. These days, the beer served at the Munich festival is golden, slightly more so than Helles (another pale, German lager style), but brewed to a higher gravity, resulting in a beer with a higher alcohol content. They are no longer the amber brews that American brewers make today which use lots of Munich and Caramel malts for color and a sweet, full flavor." So to summarize the Oktoberfest questions once and for all: The Oktoberfest beers made in America intended to mimic the style served at Oktoberfest in Munich are often nothing like the actual Oktoberfest beers served at the actual German Oktoberfest. They are often based on an older style. But that's not to say they have to be. Conscious of this discrepancy, some American brewers actually do make Oktoberfest beers that are more in line with the modern German style. And conversely, aware of American perceptions, some German breweries, export American-style Oktoberfest beers to the U.S.
To help clarify things, the Brewers Association actually breaks down Oktoberfest into two distinct styles: German-Style Oktoberfest/Wiesn and American-Style Marzen/Oktoberfest. Though you can make an assumption about which type of Oktoberfest you're ordering, if you want to make sure, it always behooves you to ask. 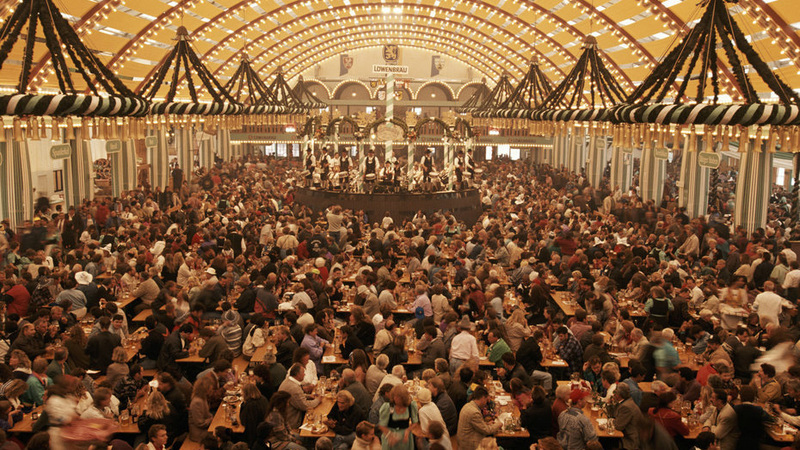 But here's a helpful tidbit: At the real Oktoberfest in Munich, only six local breweries serve on the premises: Paulaner, Spaten, Hacker-Pschorr, Augustiner, Hofbrau and Lowenbrau. Those are your true Oktoberfest beers in their purest form. By now, hopefully your understanding of Oktoberfest beers is as clear as a Dunkel—but we have one last question to clear up: If these are supposed to be Oktoberfest beers, why are the American versions based on a Marzen, German for March? Well, turns out that even though, like Oktoberfest, the style of Marzen is also named after a month, Marzen is now brewed year-round and, unlike the style of Oktoberfest, is no longer tied to a specific time period. Therefore, though the October style is still tied to, uh, September, the Marz style is no longer tied to March. And with that, let's simply say, "Prost!" Whether you're drinking a German Dortmunder-style Oktoberfest or an American Marzen-style Oktoberfest, you've earned this beer.